Beam officials at the ground breaking ceremony. UAE-based Bukhatir Education Advancement and Management (Beam), an operator of creative science schools, recently marked the launch of an international school project at a special ground-breaking ceremony in Dubai, UAE. 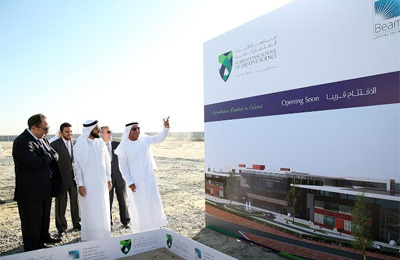 The International School of Creative Science Nad Al Shiba will be a state-of-the-art K-13 learning institution offering the UK curriculum and located in the Nad Al Shiba area of Dubai. The campus is expected to open in September 2015. The inauguration event was attended by Dr Abdullah Al Karam, director general of the Knowledge and Human Development Authority (KHDA), as well as other officials from Beam and the Government of Dubai. “All parents seek to ensure that their children find happiness at school and receive high quality education. Dubai welcomes new schools that support and nurture the well-being of children from all over the world and stimulates their curiosity to become innovators of the future.” said Dr Al Karam. "The International School of Creative Science Nad Al Shiba will bridge a major gap in the private education landscape by delivering our unique programme based on the UK national curriculum," said Salah Bukhatir, CEO of Beam and vice chairman of Bukhatir Group. “It represents the convergence of Bukhatir Group’s over a decade long experience in developing successful educational institutions and implementing advanced educational management systems in the UAE,” he added. Beam is best known for its excellence in operating the UK and US curriculum schools in Sharjah, with the International School of Creative Science and the American School of Creative Science respectively. These schools provide a unique combination of an international curriculum blended with a strong Arabic language programme, facilitated by highly experienced academic teams and technology infrastructure geared towards achieving strong learning outcomes. The new International School of Creative Science Nad Al Shiba represents an expansion in Beam’s offerings by bringing the long awaited launch of its unique educational programmes to Dubai. The campus aims to build on the long and successful legacy of its sister school in Sharjah, which has consistently delivered outstanding UK IGCSE and GCE results and was ranked ‘Highly Effective with Distinction’ by the UAE Ministry of Education. The school also holds the honour of being the only recipient of the Promethean Center of Excellence in the Middle East award for its effective use of interactive technologies in teaching and learning. The International School of Creative Science Nad Al Shiba is Beam’s latest initiative and forms part of its expansion programme that aims to provide a greater access to its schooling system in newer geographies. Beam is planning to follow up this development with the launch of the American School of Creative Science, which will be located on Al Khail Road in Al Barsha and will offer a similar blended programme built around the US curriculum. It is also making forays into higher education, teacher training and professional development services.